There’s a reason that Nebraska is known as the Cornhusker State — they grow a lot of corn there. So after driving by mile after mile of cornfields, we decided to hop off the highway and take a closer look. 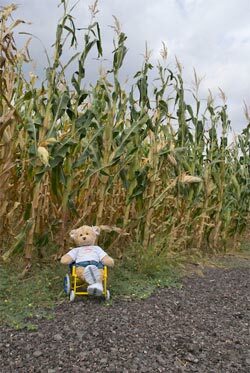 We stopped by a cornfield in back of an old cemetery and let Cherrie wheel around and explore it a bit. It was very level — most of Nebraska is — so she had no problems at all wheeling around. Of course where there’s corn, there are also grasshoppers. And Cherrie didn’t care for them very much so we moved on. In fact, we moved on rather quickly. After a few other detours on Highway 30, which was the original Lincoln Highway (you can still see remnants of the old bridges there) we hopped back on Interstate 80 and headed east towards Iowa . We made a dinner stop in Lincoln, mostly because we wanted something with a bit of a local flavor. We headed over to Lee’s Restaurant for a fried chicken dinner. The place was packed with locals, and the food was very good. Plus there’s a piano player there that plays requests. 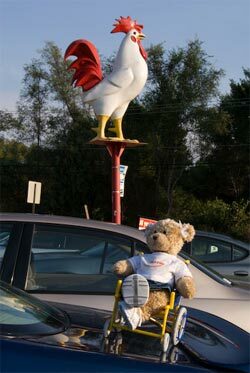 And of course, we couldn’t pass on the opportunity to get a photo of Cherrie with the landmark chicken sign out front. Tomorrow it’s on to Illinois, for a few days in Rockford.